Education has always been the key role in the development of human race and civilization, through the refinement of collective ideas that is learned and relearned through education. Advancement of economic and social progress has always been ascribed to the abundant stock of knowledge that nations have. To ensure that progress is kept going, education is important to be developed and improved. The first Islamic Educational, Scientific and Cultural Organization (ISESCO) Conference of Education Ministers that was attended by education ministers from the member states of Organization of Islamic Cooperation (OIC) reiterated the importance of education. Dr. Abdulaziz Othman Altwajiri on his opening address of ISESCO Conference of Education Ministers on 27 October 2016 in Tunis, Tunisia stressed that education is an important instrument of peace and development. ISESCO is just one of the organization that stresses the urgency of developing and improving education. Off the many strategies to develop education, there is one way that might not cross our minds before, which is quality meals for children at school age. Children, being at their critical age of their growth need quality meals that packed off with good nutrients so that their growth will not be hindered. Especially with the robust activities that children are involved, through play or learn, high quality meals are urgent. In Indonesia, children are rather prone to double burden nutrients problem, nutrient deprived or nutrient excess. Basic Health Research (Riskesdas) conducted in 2010 found that among 6-12 years old children, 4.6% are categorized very thin, 7.6% thin, 78.6% normal, and 9.2% overweight. Stunting growth are also found in children, with 15.1% are categorized as very short while 20% are short. These statistics should be worrying as not just the health of Indonesian children are concerned, but also concerning their education. Investment in quality meals is an investment in education for schoolchildren. Because if children are not healthy and deprived of good nutrients, then schools cannot function efficiently as a place of learning. Children need quality meals with good nutrients in order to develop well and perform better in learning. Problems with health and good nutrients can hinder learning process. World Food Programme (WFP) acknowledged the importance of quality meals for children, and linked it with the improvement of education. WFP proposed the program of school feeding, where in schools children are provided with quality meals. WFP listed at least five Power of School feeding. School feeding will improve the nutrients for children that will be helpful for their health, learning, and morbidity. School feeding will also keep children in schools, and also help those who are vulnerable to leaving schools such as girls and children with disabilities. School feeding also acts as a value transfer of healthy lifestyle and diet. School feeding can be a platform for wider socio-economic benefits. Thus investment in health and nutrients in schools is urgent in Indonesia. Several steps have been taken but needed to reinvigorated, steps that can be taken not just by governments, but by schools, non governmental organization, parents, or anyone. School feeding as World Food Programme has done and campaigned for is one of the steps. Another step is Usaha Kesehatan Sekolah program that was made in collaboration by four ministries in Indonesia. First step for providing quality foods to schoolchildren is to provide them with quality drinking water and proper sanitation in school. 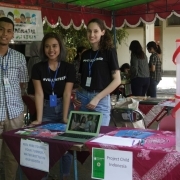 Project Child has created a participatory project and has installed drinking water filters at 24 schools around Yogyakarta to make safe and affordable drinking water available for over 3000 primary school students. Half of these schools are located in the region of Pacitan, a small Town near the coast of Jawa. These schools even have to deal with harder conditions because the drinking water is often contaminated and the structures for a reliable water access are not available. 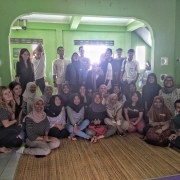 The first step Project Child took after they came up with the idea for the DWP (Drinking Water Program) was to do the necessary research in conjunction with the University of Pforzheim to gather information on the availability of drinking water and the current drinking water system in Indonesia. The cooperation will be continuing throughout the year to measure the project impact. To create a sustainable program Project Child came up with the idea to create the first “drinking water committee”. At every school two teachers, two parents and one member of project child form this committee. They give their input from the start of the drinking water filter installation and are responsible for the project throughout its process. This helps to adjust the program at every school to fit the local and individual requirements regarding the sourcing of water and the collection of payments. Further this grants Project Child the possibility to start an educational program at the schools, which includes topics regarding environmental causes. You can help by donating for the installation of the drinking water filter to make it available to more schools.